How to fetch data from database in codeigniter? CodeIgniter is the simplest and light PHP framework which lets you create robust web applications in no time. Using Twitter Bootstrap with CodeIgniter saves the hassle of writing CSS Stylesheets for your app and lets you focus on development. Later you can customize bootstrap styles to suit your need. That is the best part of using MVC pattern as the presentation (view) is separate, you can change the look and feel of the app anytime without disturbing the rest of it. kodingmadesimple.com have good amount of twitter bootstrap tutorials about customizing bootstrap 3 and I recommend you to go through our bootstrap tutorials section. Now we'll see how to read data from MySQL Database and display it in a neat table format with Bootstrap. Since we are going to use bootstrap we don't want to write any custom stylesheets for formatting the display. If you are not familiar with using Bootstrap with CodeIgniter, then you must read this tutorial on How to integrate Bootstrap with CodeIgniter. In this CodeIgniter tutorial, I'm going to read data from the MySQL database and display it in a neat table format using Bootstrap3. For example assume we have a DB called employee which has the below two tables. Now I want to display the entire department list along with the head-of-department employee name. 1. First create the model with name department_model.php in the folder system/application/models. Then add a function to read the department list from the DB. 2. Next create the controller file with name department.php in the folder system/application/controllers. In this controller call the model function to get the department list and pass it to the view file for presentation. 3. Finally create the view file with name department_view.php in the folder system/application/views. Now parse the data received from the controller one by one and display it. 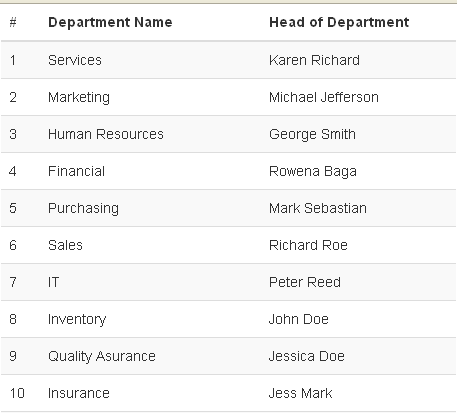 In order to display the department lists in a neat table format use the bootstrap built-in classes table, table-striped & table-hover. As I've said earlier in this tutorial we haven't written any CSS styles of our own, yet we get a neatly formatted table list by using bootstrap classes (Nice isn't it?). That explains about fetching data from database in codeigniter and display it in html table using bootstrap. Would you like me to share a function that builds a table from an array?? It's just native php not CI ready. Please check this link to add pagination in codeigniter. I've already followed those instructor, but how do I access the view? hi, could you write example for display more tables in a page? ?